Skellig Rocks with the Ring of Kerry landscape in the distance. 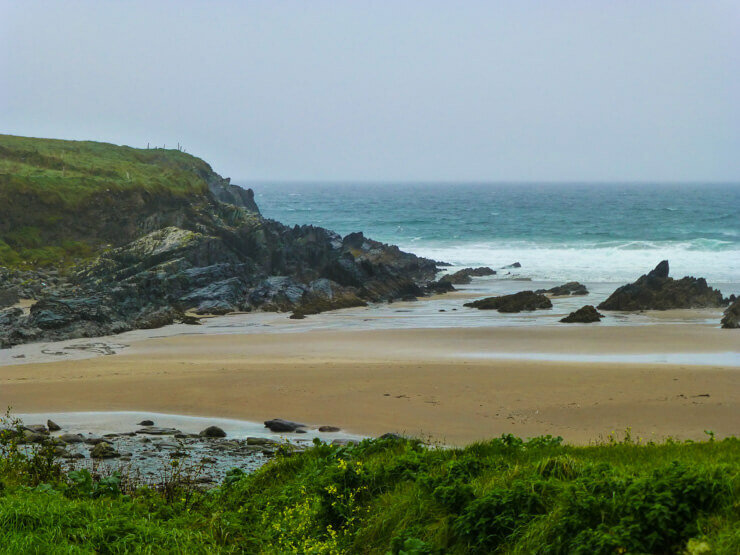 The Ring of Kerry is one of the top spots for visitors to travel to in Ireland for good reason: the scenery is gorgeous thanks to being right next to the coast and there are historic sites, pretty towns, and panoramic lookout points all along the drive. The Ring of Kerry drive itself is around 111 miles long, but takes much longer than it sounds like it would to drive due to narrow roads, many stops at which you’ll want to get out of the car to look around, and possible traffic congestion. In other words, you’ll want to devote a whole day (and maybe two or three) to exploring the Ring of Kerry. Scenery from the coastal loop drive of the Ring of Kerry. 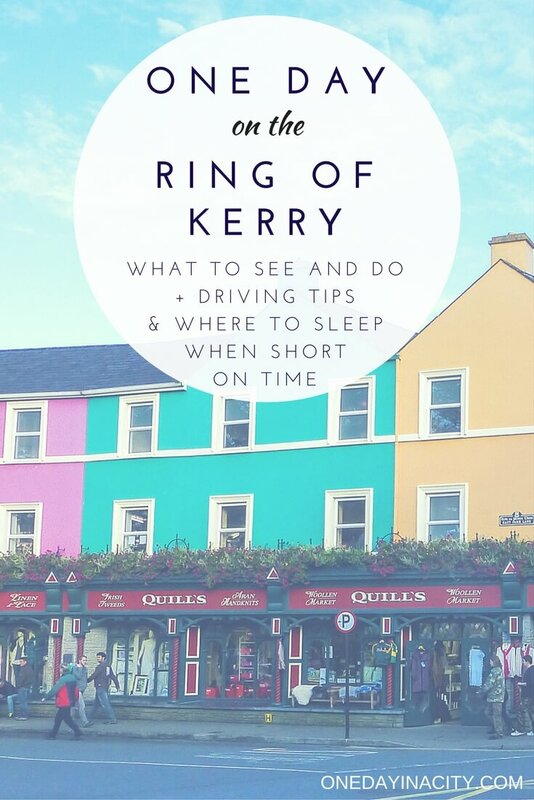 I set up this guide to start in the lovely town of Kenmare which is my recommended first stop to explore whether you stayed the night in Kenmare or are coming from the larger Kerry city of Killarney (though be sure to read my Killarney section below to find out why I’m recommending skipping the Killarney sites you’ll be passing and heading straight for Kenmare). 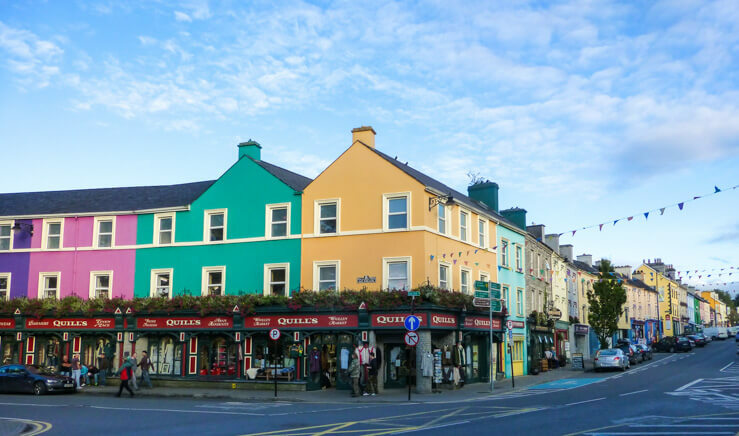 Along with including more on Killarney later in this guide, I’ll also be sharing my recommendations on where to stay while exploring the Ring of Kerry, what to pack, and when to go. The direction you drive around the Ring of Kerry matters — and I don’t just mean because they drive on the left hand side of the road in Ireland. You’ll likely read differing recommendations on which way to go on the Ring of Kerry. Most of the guidebooks say to go clockwise so you’re going the opposite direction of the tour buses, which go counter-clockwise. However, I got a tip from Geraldine at Rozzers Restaurant (a restaurant near Killarney I highly recommend), which made sense; she said to go counter-clockwise and just start a bit later than the tour buses that depart from Killarney (who are probably on a faster pace than you) so you aren’t stuck behind them, but won’t have to navigate traffic going against tour buses coming toward you on narrow roads, which can be a bit scary! Makes sense, particularly if coming from Killarney. However, if you’re starting your day in Kenmare, I still think clockwise makes more sense. 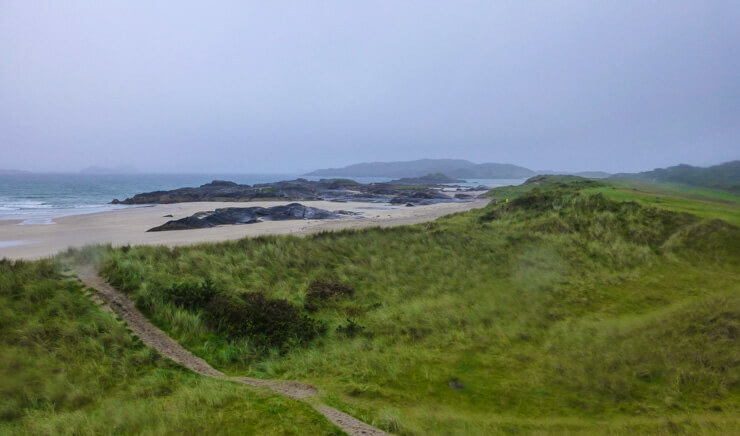 Most of the sites you’ll want to see are on the south side of the Ring of Kerry, so start your day early to get there before the crowds of people do. You’ll also get to Valentia Island (which you’ll be reading about shortly below) about the same time as the tour buses so while you’re exploring there, the tour buses will be going by (they don’t go onto Valentia Island) and so you shouldn’t run into too many of them when you continue your way up the Ring of Kerry’s north shore. Kenmare is pretty darling. Candy colored buildings pop out at you in angled rows and inside those buildings are boutiques, pubs, and B&Bs plus a cool lace center. It’s a lovely little town to walk around in and grab a bite to eat. Mahoney’s Pub has a fun, laidback atmosphere and yummy fare – I got the Guinness stew and loved it. I loved the big Guinness on this green building! 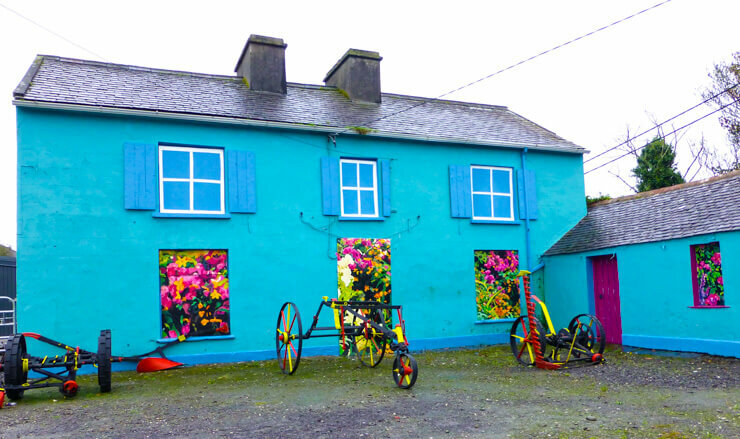 Kenmare is a fun place to stay overnight, too, while exploring the region. 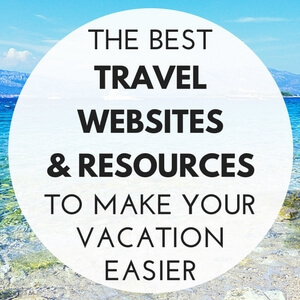 For more on that, keep reading down to the accommodations section of this guide. 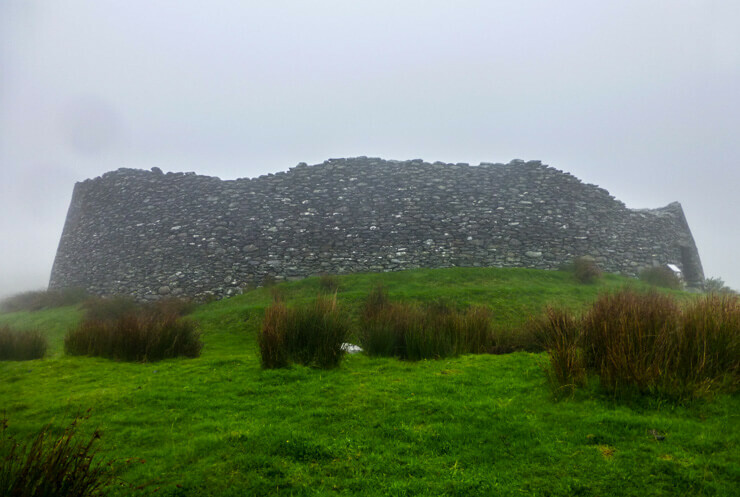 Stone forts (with the “beehive” ones being the most famous) are prevalent on the west coast of Ireland. Of them, Staigue Fort along the Ring of Kerry is one of the largest and believed to have been built in the early centuries AD. While it’s not known for sure why it was built, it’s believed it was for a prominent and wealthy chieftain who had a need for a strong, secure fortress. You can walk around the inside of Staigue Fort. 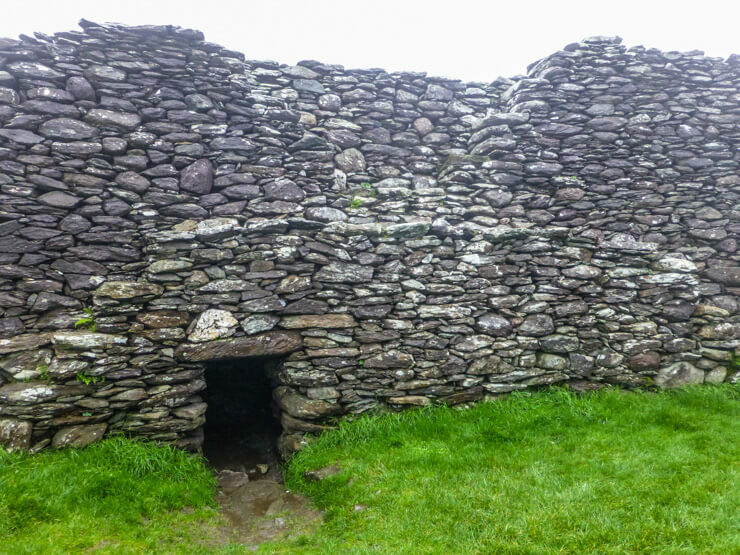 Staigue Fort is interesting to walk around as you’ll find a large circular wall with ledges, steps and formidable chambers within the wall. It becomes even more intriguing once you realize it was built without mortar to keep the stones together and instead the stones are interlocked securely and tightly together. Inside the walls once would have stood homes of some sort, but those are long gone now. This gorgeous stretch of beach is charming beginning right from the narrow trail that leads from the road to it. The trail cuts through low brush over a shallow hill that then spreads out into a wide sandy beach framed by sloping cliffs on each side. Long rocks that looks like they’ve been haphazardly tossed on the sand add a rugged element to the wide beach. Get ready to learn more about one of Ireland’s great historical figures at Derrynane House, which is the ancestral home of Daniel O’Connell, who is also known as “the Great Liberator.” Daniel O’Connell was instrumental in achieving Catholic Emancipation from Britain, which he believed was the necessary first step to achieve home rule for Ireland. Though he died in 1847 before Ireland achieved its independence, the strides he made for the cause has earned him a prominent role in Irish history. While touring Derrynane House, you’ll learn more about Daniel O’Connell and you’ll also see 18th century architecture. The house was lived in by Daniel’s descendants until the 1950s and is now a museum showcasing family portraits and items from Daniel’s life. Derrynane House has a low entrance fee which gets you a 30-minute tour of the house and access to the grounds. After Derrynane, it’s on to Ballinskelligs, which was one of my favorite parts of the Ring of Kerry drive. If you want to increase your chances of hearing Irish spoken while in Ireland, this little village is the place to head. I stumbled upon Ballinskelligs by chance. It hadn’t made it onto my main itinerary for the day, and during a particularly stressful patch of rain that I was driving through, I quickly turned off the main road and drove through the village looking for a pub to rest in for a bit. I found Tig Rosie. Upon walking into Tig Rosie, I felt a bit out of place. There were about 10 men sitting in the pub enjoying a pint and they all looked like locals. 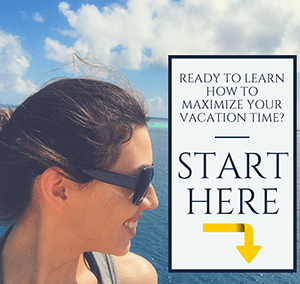 I was wondering if I had stumbled upon a place where tourists weren’t welcome, but that feeling lasted only about half a second since I was quickly greeted with smiles, and a friendly bartender took my order when I tentatively sidled up to the bar. Two friendly old men and a younger guy chatted amiably with me about life on the west coast of Ireland for awhile, and though I admittedly couldn’t always understand them due to their thick accent and occasional Irish, I felt happy and jolly upon leaving – and with a couple new spots to check out before leaving Ballinskelligs (see the beach and castle below). 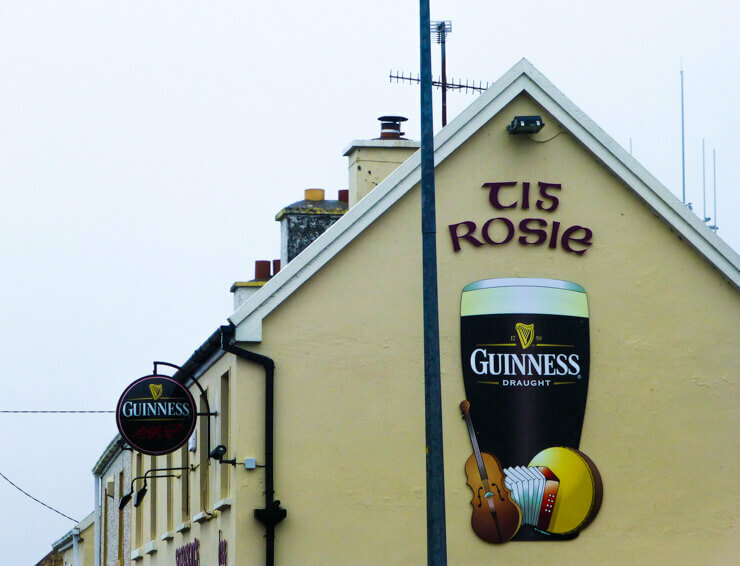 Tig Rosie wasn’t as “quaint” or “cute” as some pubs in Ireland, but I felt like I’d stumbled upon a genuine slice of Irish life and it’s the pub I think back to most fondly from my time in Ireland. If you’re in need of a break from driving around this point, I highly recommend stopping in! 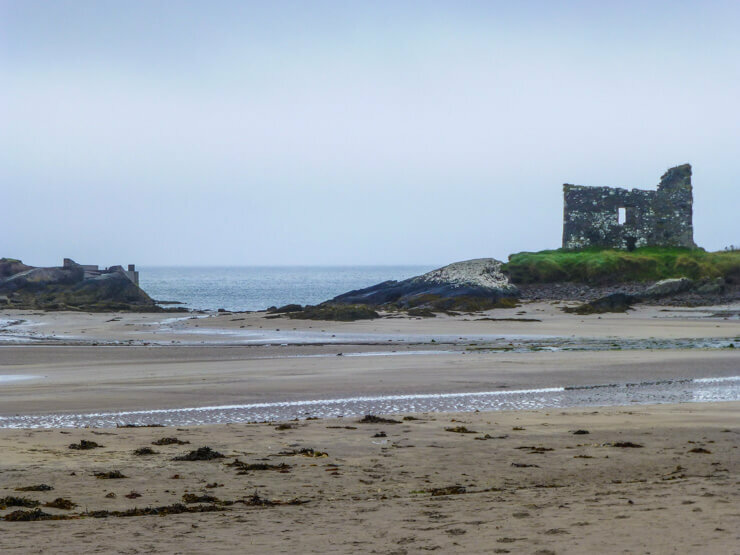 Ballinskelligs Beach is a rugged piece of coastline that is accentuated by a jagged ruin of a structure. This structure is Ballinskelligs Castle, known locally as McCarthy Mor Castle, but is actually the remnants of a House Tower that was erected in the 16th century. From Ballinskelligs Beach you can also get a good view of the town of Ballinskelligs, if it’s not too cloudy. About nine miles from Ballinskelligs is “Kerry’s Most Spectacular Cliffs.” Check them out for yourself to see if you agree. I thought they were pretty cool, even in fog. Rugged and rough waves on a cloudy day. To access the cliffs, park by the yellow building and head inside where you can get a pass to the land for a small fee. Inside is also a little café where you can purchase a sandwich or cup of coffee. Along the way to the cliffs (which is about a 5-minute walk) you’ll also pass beehive huts. 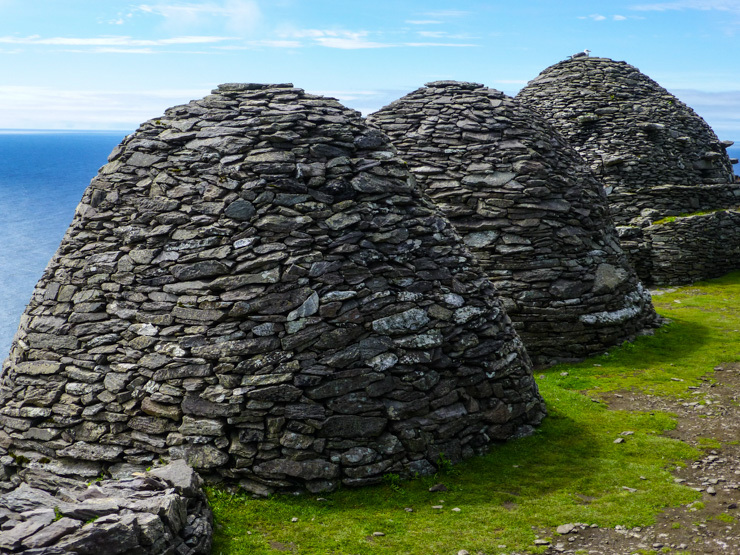 These are replicas and I recommend skipping exploring them if short on time, especially if you’re headed to Skellig Michael or Dingle during your trip (where you can see real ones from centuries ago). 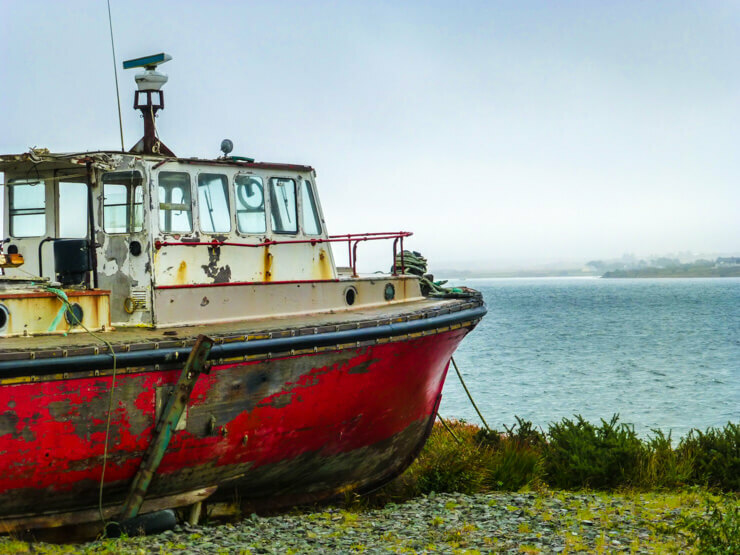 Rugged, wild landscape awaits you on Valentia Island. Now it’s island time! Valentia Island that is, which you can see from the main road of the Ring of Kerry and is quick to get to via the bridge. 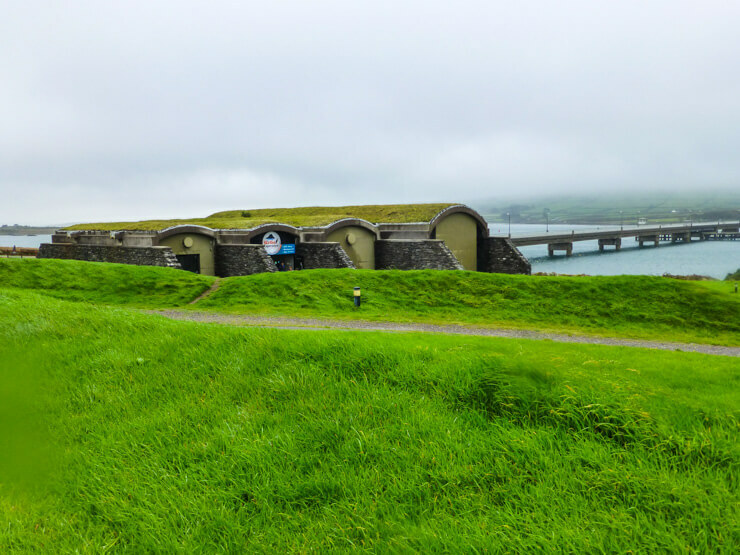 The first thing you’ll see upon crossing the bridge is the cool grass-roofed building that houses the Skellig Michael Museum. If you’re not actually visiting Skellig Michael, I recommend stopping in here to learn the history, otherwise you can skip it as you’ll learn most of the information while visiting the actual island of Skellig Michael (more on that coming up below soon, I promise!). Though if you’re very into the history of it you may still want to stop. Those with kids who need to get out of the car also may find this to be a nice stopping point as there are some interactive displays geared toward children. 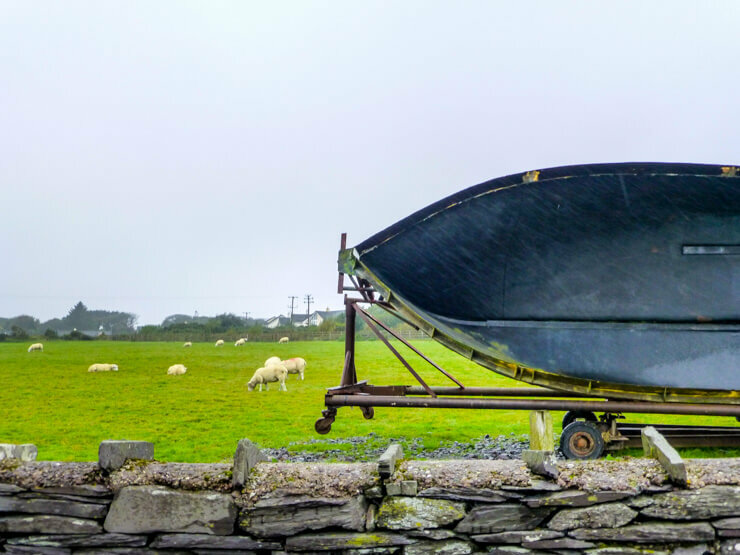 Sheep and boats dot the landscape in Valentia. 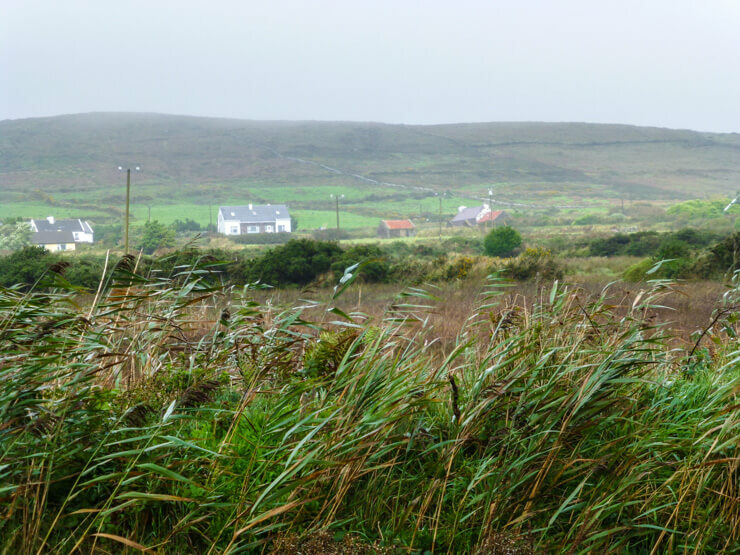 Most of your time on Valentia Island will be just driving around taking in the rural countryside and coastal views. It’s not often that sheep and farmland is seen right next to the coast so it’s pretty lovely to see. Valentia Island has its own harbor (you can also take a car ferry to Valentia Island instead of the bridge – mostly for the experience of taking the ferry, which I don’t think is necessary if short on time) with a few restaurants clustered by it, which are a good stopping point for a bite to eat if you’re feeling hungry. The restaurant at the Royal Hotel Valentia had prompt service and reasonable prices with plenty of seating options indoors and out. 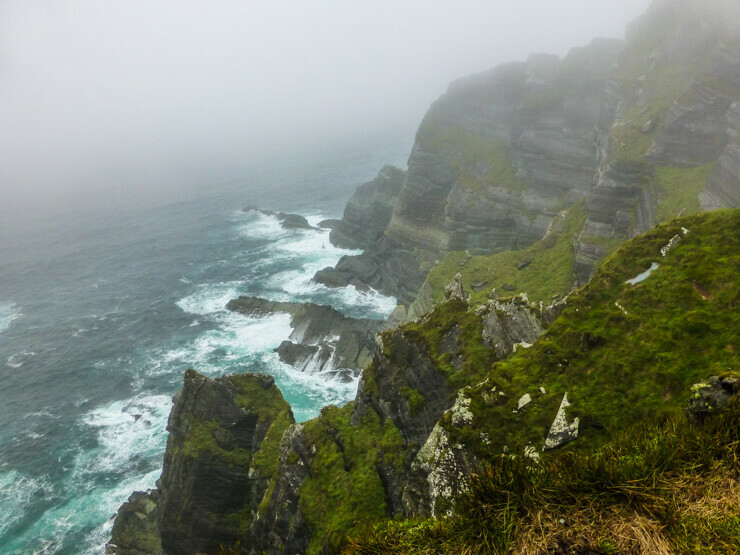 If you aren’t going to Skellig Michael, then check out Geokaun Mountain and Fogher Cliffs. Geokaun Mountain is one of the highest points along the Ring of Kerry, and for a small fee you can drive to the top for gorgeous 360-degree views of the ocean and Skellig Michael (on a clear day anyway) plus Valentia and the mainland of Ireland beyond it from the two main lookout points called Miner’s View and Shepherd’s View. If you have time, you can also take a short walk to Fogher Cliffs for some impressive landscape views. I think visiting Geokaun Mountain and Fogher Cliffs is unnecessary to do if short on time if you’re going to Skellig Michael since you’ll get some pretty awesome views from the boat. Ok, ok, I’ve alluded to Skellig Michael enough, now let me tell you about it. If you’re not already in the know about this place, you’re going to want to be because it is easily the coolest, most magnificent thing about the Ring of Kerry (even if it’s not technically right along it as you have to take a boat to it). Here’s why. Skellig Michael is a massive, vertically inclined rock that is located about an hour boat ride off the shore from Portmagee. It looks like it should be inhabitable…but for many centuries it was the home of a small group of monks who lived in beehive huts. 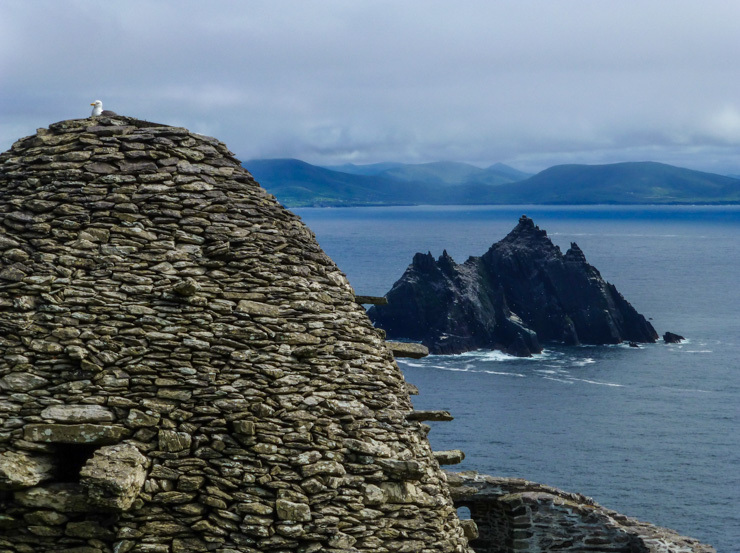 It has always been a mystical, in-demand place, but now it has another claim to fame as the place where the last scene of Star Wars Episode VII was filmed, which means it’s ridiculously in demand now. Boats are booking out up to six months in advance since Star Wars came out. Also, Skellig Michael can only be visited from mid-May to through the end of September. To see more pictures of Skellig Michael and to find out how to try to get on a boat that drops you off there if reservations are fully booked, click here to read more about my visit to Skellig Michael. 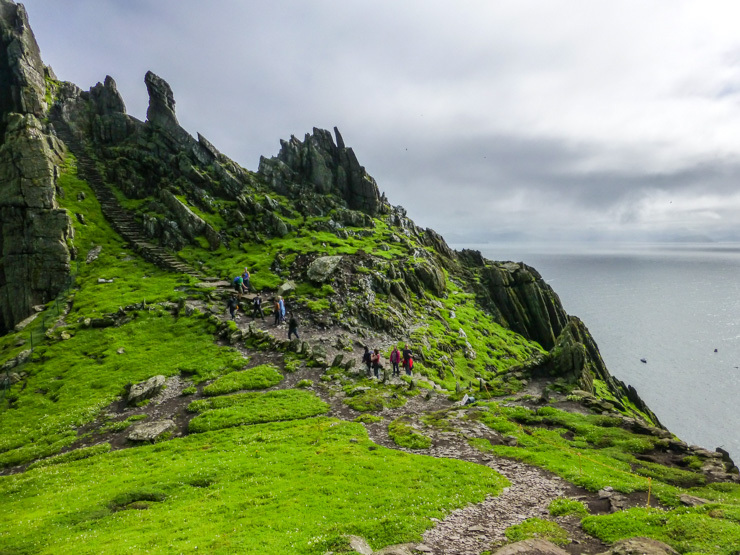 One more note – if you try to do Skellig Michael and the other sites along the Ring of Kerry listed in this guide on the same day, it is possible, but it is going to be a long day and you are going to be exhausted by the end of it. 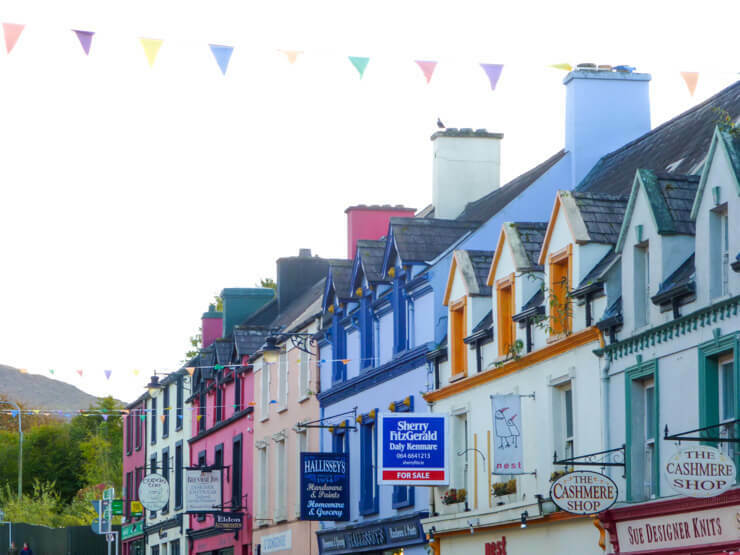 If you can break it up into two days (or even better, three) and maybe stay overnight for a couple nights in Kenmare (more on that below), that would probably be easiest for you. 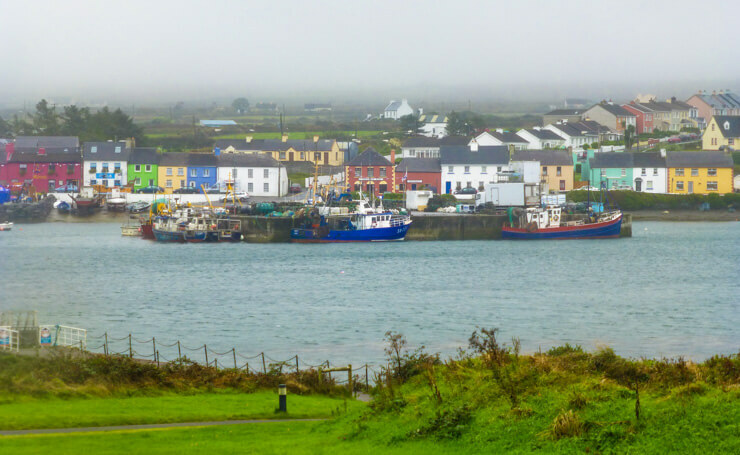 Once you’ve left Portmagee behind to continue your drive, then for the rest of your day around the Ring of Kerry enjoy the views and listen to some Irish music while you drive back to your hotel. 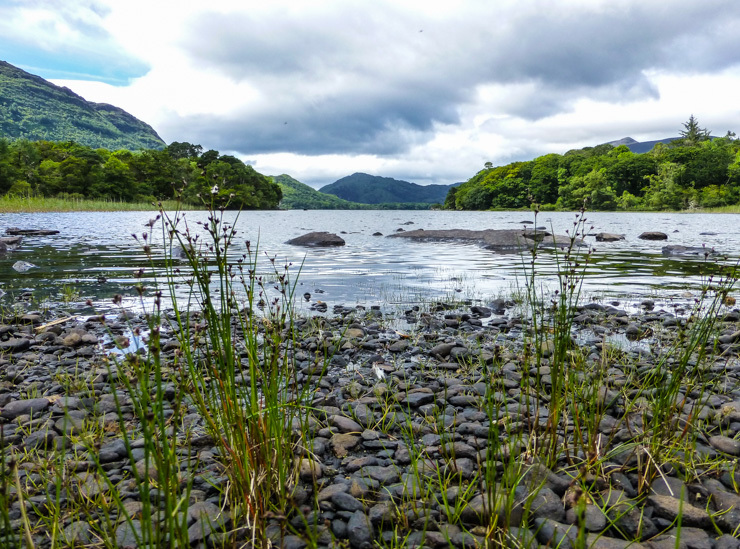 But wait, you’re saying, what about Killarney National Park? 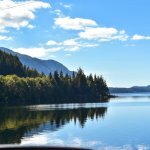 Oh yes, I didn’t forget that, but as you can tell from this article, there is a lot to see in Kerry and it’s a long drive around the ring, so I recommend breaking out Killarney National Park into its own day. You can read more about my suggestions for that in my One Day in Killarney blog post. Brook Lane Hotel: This is where I stayed in Kenmare and I loved it. The owner and staff are super friendly, the boutique-style accommodations are spacious and luxuriously appointed, and the breakfast is delicious. Plus, it’s located in a quiet part of town that is just a 4-minute walk along a quaint little country trail to the city center. For pictures and prices of Brook Lane Hotel, click here. To browse all Kenmare hotels, click here. 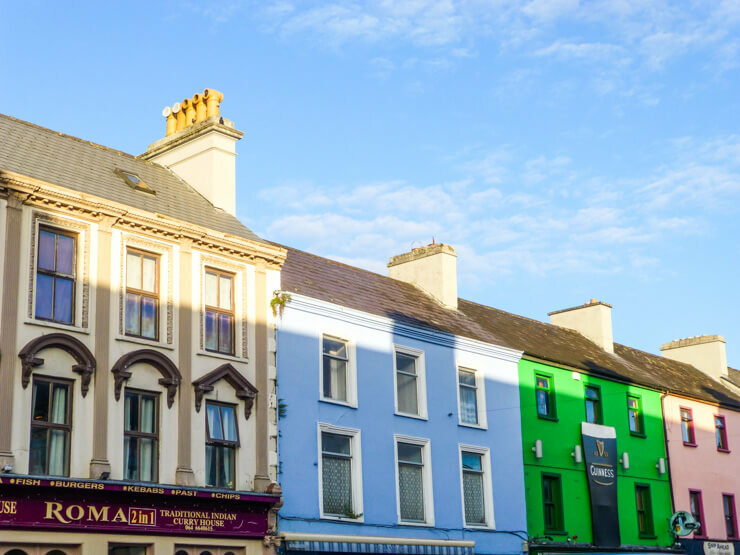 If you’re going to be exploring the area around the Ring of Kerry and Killarney for several days and don’t want to switch hotels, Killarney is a good homebase due to close proximity to the Ring of Kerry drive and the city’s top sights like Muckross Abbey and Killarney National Park. 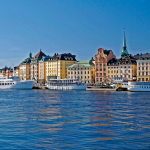 Plus, it has plenty of restaurants and pubs to choose from in the evening. Muckross Park Hotel & Spa: This gorgeous hotel is my top accommodation pick for Killarney, and it stands out thanks to its historic and luxurious rooms, and its 5-star service. The spa pool and outdoor, woods-adjacent hot tub is blissful to relax in after a long day driving the Ring of Kerry or hiking around Killarney National Park. My husband and I loved relaxing in it after our morning at Skellig Michael and long drive around the Ring of Kerry back to the hotel. For pictures and prices of Muckross Park Hotel & Spa, click here. To browse all Killarney hotels, click here. 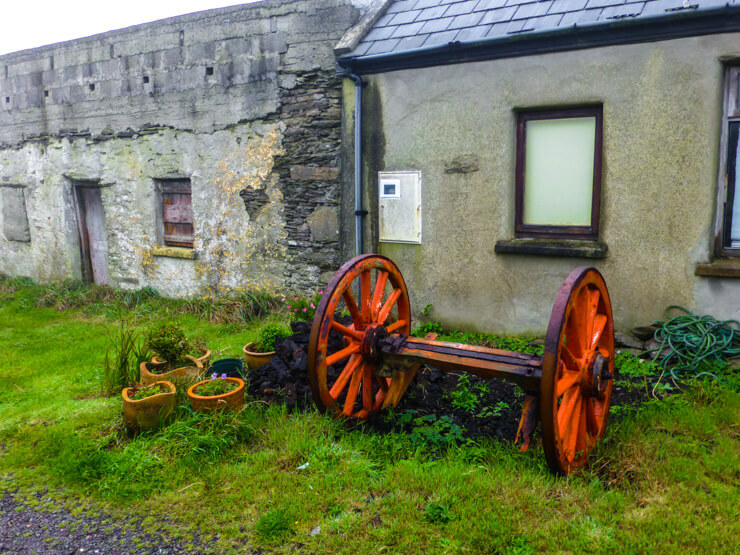 If your trip is all about Skellig Michael, you may want to stay closer to Portmagee. 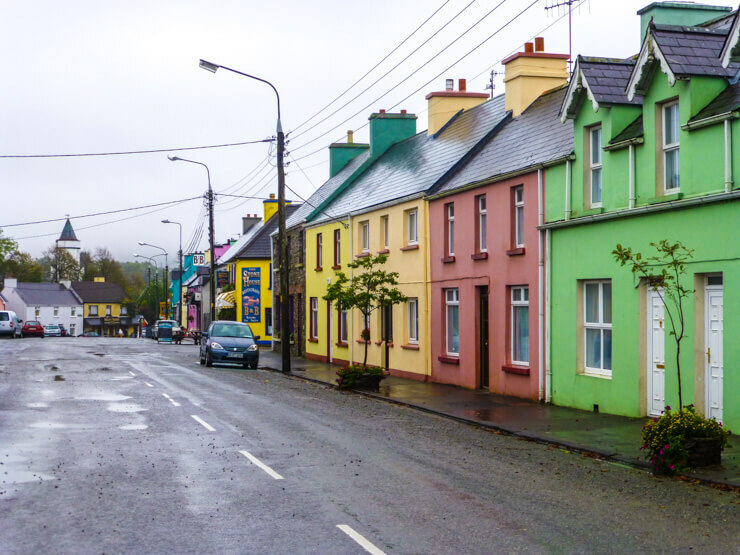 There are a few guest houses in Portmagee, but there’s really not much else to do there, so if you’d still like an actual Irish town to stay in with hotels, try Cahersiveen, located about 20 minutes from Portmagee. Kerry Coast Inn: Conveniently located in downtown Cahersiveen and is a warm, family-run inn. 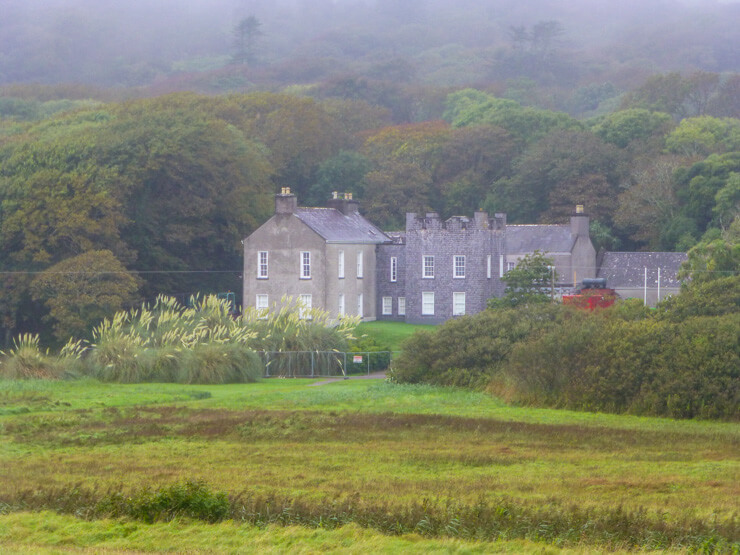 For pictures and prices of Kerry Coast Inn, click here. Comfortable Shoes Easy to Drive In — You’re exploring ancient ruins, natural wonders, and historic sites so you’ll want to make sure your feet are in sturdy shoes, but you’ll also want them comfortable to drive in. Try this style for summer — sturdy and stylish. Closed-toe shoe option for rainy weather. 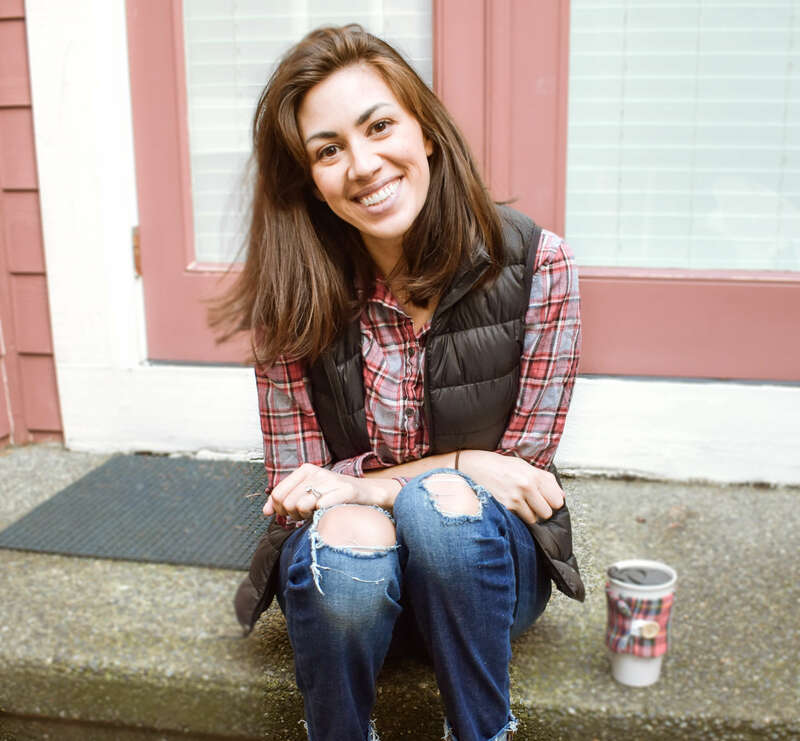 T-Shirts and Athletic Jackets — You want clothes with easy layers during your drive so you can take them off if you’re hot in the car and put them back on for a cooler walk outside. Yoga Headband — I like to bring a sports or yoga headback to easily cover my ears since they sometimes hurt when it’s really windy (which it can be along the coast in Ireland) — and when I don’t need it for that, it nicely keeps my hair out of my eyes — better for taking in those lovely views. Sunglasses — Also, it doesn’t alway rain in Ireland and it can actually be quite sunny in the summer (with bouts of rain thrown in) so don’t forget your sunglasses either. You don’t want to be squinting at those amazing Ring of Kerry ocean views! I always make sure mine are polarized for traveling, like these ones. A Detailed Guide — You’ll be able to find a paper map of the Ring of Kerry in Killarney and Kenmare (your hotel will likely have one), but if you want something more intensive, grab a guidebook. I’m a big fan of Rick Steves guidebooks — he puts a lot of personality into them with great tips. Foggy (yet still pretty!) view along the Ring of Kerry in October. One last note for spending one day around the Ring of Kerry. I’ve done the Ring of Kerry drive twice. The first time was the beginning of October (but just missed the season of Skellig Michael tours, which is a big reason I wanted to go back!) and the second time at the end of July. These two trips were only a few years apart and so not much had changed besides the timing of the trip and that made a notable difference. The ambiance of my time in the Ring of Kerry was drastically different by going in the off-season. I had beaches and lookout points to myself in October. I had plenty of winding roads on which I never passed another car (thank goodness as that was the trip I was driving by myself! Left hand side!). 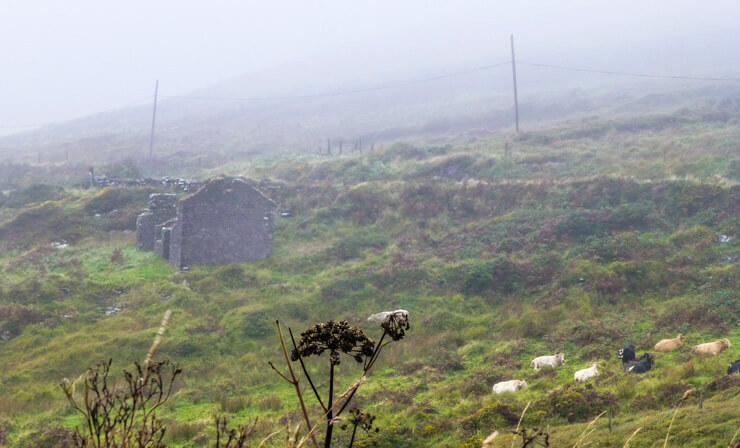 It was foggy that October day and the mist seemed to add this secret mystique to my journey, like the Ring of Kerry was unfolding mile by mile just for me to explore. It was almost meditative for me, and though I didn’t make it to Skellig Michael, I could understand why the monks were drawn to this place…and then further offshore. Clear, blue skies and sunshine in July. 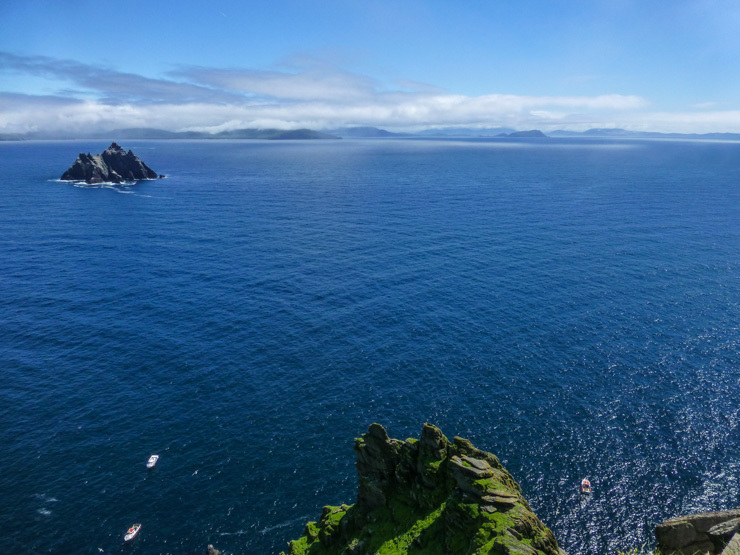 Switch to July…it was still beautiful and the views from the coast were clearer, and I got to Skellig Michael (yay! ), but…there were so many people everywhere and so many cars on the road! It made the road trip feel more like work instead of leisure and caused some headaches on finding parking at main sites. That is why I recommend going to the Ring of Kerry on the off-season if you can, but before Skellig Michael ends. 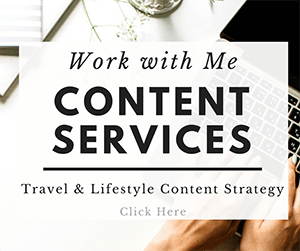 This isn’t possible for everyone, particularly if traveling with school-age children, but is worth taking into consideration when planning your trip. The weather might be hit or miss in the summer anyway and so won’t be that different from the fall. Wowww. Every picture looks so amazing especially Kerry’s most spectacular cliffs and Beehive Huts. Ring of Kerry is definitely on my must bucket list. This was helpful in planning my trip to Ireland next week. Thank you!! Glad to hear you enjoyed it in the autumn!